You want a vehicle that comes with outstanding design features, right? Then look no further than the 2019 Ford Ranger. You may know the Ranger as Ford's new midsized pickup truck. Well, your friends here at Wilson Motor Company have some more details for you. The 2019 Ranger offers outstanding versatility. And whether you go with SuperCab or SuperCrew, you will have spacious seating and a large truck bed. That means that you can take everyone and everything along with you on your journey! Depending on whether you choose the SuperCab or SuperCrew, you will have the choice between a five to six-foot bed. 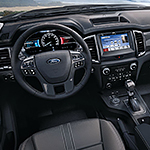 Inside the Ford Ranger, you can find an LCD touchscreen. This touchscreen gives you access to some of Ford's most modern safety and entertainment technologies. This truck must be experienced in person. Come down to our dealership today, and take a Ford Ranger for a test drive.